Ji Ho Choi: "I just want that everyone knows the truth ..."
The discussion about the PSS seems endless, and while businessmen and sports leaders blame each other, it is not clear what PSS will be used in events already scheduled ( See: PATU Calendar). This “soap opera” in the Pan American Union that puts Choi´s administration in the “eye of the storm” only adds confusion to the athletes that have already planned to compete in the “G” events to be held in the continental union this year. When masTaekwondo.com asked Choi again about the PSS issue, he said: “When we held the PATU General Assembly meeting, most members agreed to use KP & P, as this company presented us the best offer”. Given Choi´s comments, we asked him to tell us what were the offers received from both companies (Daedo and KP&P), to which he replied: “Both companies were given the possibility to present their proposals. Daedo offered $ 40,000 with an exclusive contract to use their brand in all events sanctioned by PATU, including a clause forbidding the use of any clothes showing any other brand than Daedo. On the other hand, KP & P presented an offer for $ 50,000; they asked to use the KP&P PSS in the PATU events, however they gave us the freedom to have another sponsor. Additionally, they offered to send for free four sets of Taekwondo equipment to each of the MNA member nations. Analyzing both offers, I considered that the best offer was KP&P´s and it was supported by most of the members of the PATU General Assembly”. During the telephone interview masTaekwondo.com had with the President of the Costa Rican Taekwondo Federation, Wilmar Alvarado, he confirmed that in the Costa Rica Open the Daedo PSS would be used. At this respect, Choi said: “Mr Wilmar Alvarado was one of the first to accept KP & P offer, but he changed his mind after Daedo approached him and consequently he did not respect the previous agreement we had”. Choi told us that he cannot understand Alvarado´s reaction since KP&P had offered to provide for free all the equipment needed for the competition. The Costa Rican Open organizing committee would only need to provide the two airline tickets for the KP&P technical staff. “I was very surprised by Alvarado´s comments saying that they did not have any financial resources to buy a new PSS other than DAEDO, because he knew KP&P would give them such support for free. They would not incur in any costs”. Choi said. “Some organizing committees failed to send on time the respective fee of $5,000.00 so their event is ranked as “G”. Some of them even asked for extensions in the deadline which were granted in order to give them more time. Regarding the Costa Rica Open, I was forced to send them various reminders asking them to make the deposit, something that has not been done yet”. Choi continued. These situations only generate confusion among the athletes since they do not know what events are ranked “G” or what brand of PSS will be used in the competitions, situations that don´t allow them plan in advanced. 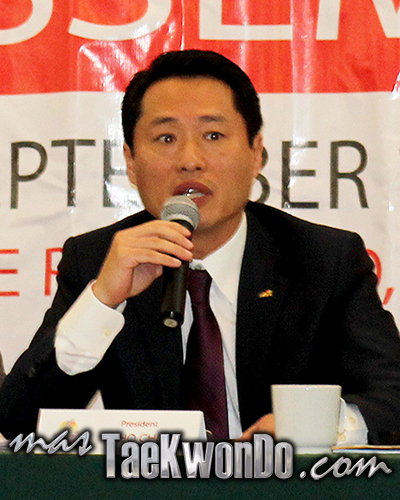 Regarding the Canada Open, the organization confirmed that they will use Daedo PSS, additionally the official who spoke to masTaekwondo.com told us that there is an internal conflict in the Taekwondo leadership in Canada and that the 2014 competition is being organized by the Montreal Taekwondo Association, not the Canada Taekwondo Federation. According to the official comments the 2015 Canada Open will use KP&P PSS. MasTaekwondo.com conversation with PATU president lasted more than an hour and finally he bluntly said: “I just want that everyone knows the truth. I’m tired of appearing as the bad guy, when my sole purpose is to collaborate with the development of Taekwondo in our continent“. “They (kpnp) offered to give four sets of taekwondo equipmwnt to each MNA”. How about Asian MNA? Kpnp also offered to give sets of equipment to each MNA since Asian Junior Championship in Jakarta, we are still waiting for the realization.